Do you love soul music? Are you a Motown fan? Are you a fan of James Brown, Aretha Franklin, or other soul music legends? Would like to go somewhere you can listen to your favorite music on the computer and dance at the same time? You can do all that and even host corporate parties, weddings, dinners, anniversaries and other special occasions at the Stax Museum of American Soul Music in Memphis, Tennessee. At Stax Museum you can do all that and more. The Stax Museum of American Soul Music has it all. You can learn about the gospel roots of your favorite music by viewing a documentary film that shows the roots of the music in the 100-year-old Mississippi Delta church. The careers of musical greats, such as Otis Redding, the Staple Singers, Isaac Hayes, Booker T and the MGs, Aretha Franklin, and Ike and Tina Turner are highlighted. There are more than 2,000 exhibits, videos, photographs, stage costumes, and instruments used to record sounds for Stax records. Some exhibits include: the sequined dress Tina Turner wore on stage; Otis Redding's favorite suede jacket; the famous purple flying V guitar used by Albert King; Ike Turner's Fender guitar and silver lame suit; and Booker T Jones' organ, which he used to record Green Onions. When you visit the Stax Museum of American Soul Music, you will want to visit the Hall of Records, which has 800 single records and 300 LPs. You can even stand on the exact spot of Stax's famous studio A, where famous Stax music was made. The museum gallery hosts seasonal exhibits. These have included photography exhibits of the Beatles, the Rolling Stones, the world's greatest hip hop artists, Bob Dylan and any famous Blues musician you can think of. Stax Museum lets you attend concerts, educational programs, opening receptions, member parties, and other events. Stax Museum is exploring the resurgence, current life, and activity of soul music through photography. Stax Museum has provided admission to such concerts as "A Salute to Divas," highlighting the music of Gladys Knight, Aretha Franklin, Mary Blige, and other past and current superstars. Those who attended and got to see performances by students and to one of the best known soul and gospel singers in the world, Candi Staton. The Stax Museum is located near other sights such as Elvis Presley's Graceland, Sun Studios, and the Smithsonian Rock 'N Roll Museum. 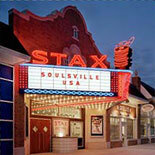 Stax Museum is one of the few museums dedicated to soul music. Stax Records changed the course of music in the United States and internationally forever. A tiny record store in a movie theatre grew to become one of the most important recording studios anywhere. Stax Records launched the careers of then unknowns such as Otis Redding, the Staple Singers, Isaac Hayes, Luther Ingram, and Wilson Pickett. At the museum, you will also learn about stars for Motown, Atlantic Records, and the contributions of the Jackson Five, Al Green, Aretha Franklin, James Brown, and Ray Charles. You can even see video footage of such artists, and Stevie Wonder, Marvin Gaye, Sam Cooke, Patti LaBelle, and others. Stax Museum is helping to mentor at-risk young people. The museum provides music education and chances to perform to young people who might not otherwise receive either. The museum also operates the Soulsville Music Academy. The charter school provides a musically rich, yet academically challenging, education in language arts, orchestra, math, and science. The school's orchestra has performed for Isaac Hayes and Stevie Wonder. The museum offers soul music concerts, the chance to help mentor young people at risk, as well as the chance to see numerous photographs, videos, and other exhibits of your favorite stars. Stop by Stax Museum for a visit to the Satellite Record and Gift Shop.